Sports purists and traditionalists can be a pretty insufferable bunch, always talking about the integrity of the game and how any change will be the death of the sport. Well, as annoying as their rants may be, they’re not always wrong. Sometimes, change for the sake of change or to capture the public’s attention is just too egregious to forgive. Companies will launch ideas or concepts that are, at the least, misguided and at the most, insulting. 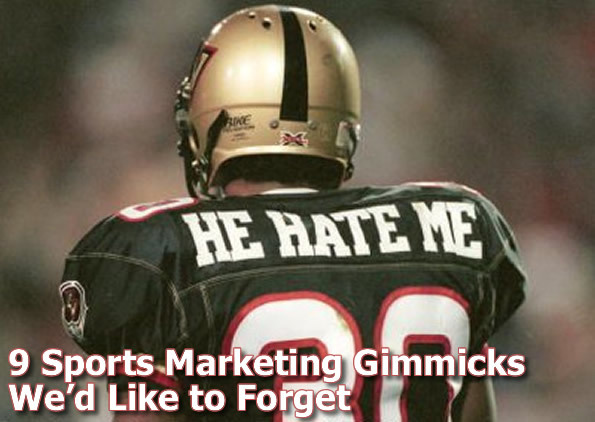 Here are 9 instances of horrible marketing gimmicks that may mean (GASP!) those obnoxious purists are right: change can’t always be forced. 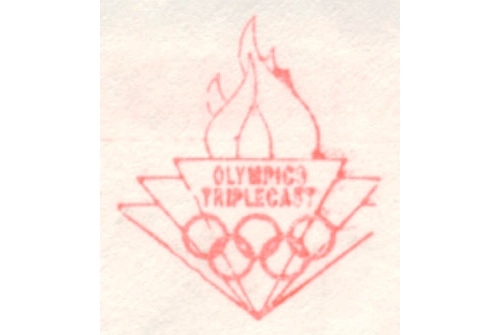 NBC’s plan with the Olympic Triplecast was to offer expanded Olympic programming to those willing to pony up $100 or so to watch the 1992 Barcelona Summer Olympics. Apparently, people were satisfied with NBC network coverage, because no one bought the expanded package, despite the fact that subscribers were given a special remote with red, white, and blue buttons corresponding to the three different channels. Since the brilliant remote-giveaway ploy didn’t pay off, NBC found themselves out $100 million. They never went with PPV again, instead putting less desirable programming on NBC-affiliated cable channels. A gimmick in the truest sense, the FoxTrack (nice name) puck was innovated to capture more casual fans (which is good) by alienating all existing fans (which is bad). In response to people claiming that the puck was too hard to follow, Fox developed a puck that could be electronically tracked, placing a glowing cloud over it so it could be easily seen by everyone. Only it didn’t work. Rarely was the cloud was directly over the puck. Instead, it seemed to be shaking randomly, distracting the viewer even more. Further, when the puck was obscured by the near-side boards, the glowing cloud would float over the first couple rows of fans, which was just irritating. After debuting at the Boston All Star Game in 1996, FoxTrack circled the drain for two years before being put out of its misery. While one could argue that the advent of a league is more than a “gimmick” in most instances, that argument doesn’t really hold water for these next two entries. The XFL failed because, despite being a league, it was nothing but a gimmick. There was no substance to the league, which tried marrying the WWE’s sensibilities with the mainstream appeal of the NFL. The final product was insanely dumbed-down, and offered entertainment only through its scantily-clad cheerleaders and some dude that had “He Hate Me” on his jersey for reasons beyond comprehension. Ratings after the premiere were abysmal, and it didn’t last a season. The USFL was less gimmicky than the XFL, but still didn’t really do anything to improve on its older brother, the NFL. It’s season ran during the spring, apparently to give football fans their fix during the NFL’s off months. Their decision to go into NFL markets may have been their demise, as serious NFL fans were unlikely to defect to the USFL, even though the USFL boasted some pretty decent alumni when the league folded in its fourth year in 1986. Let’s face it, finding a mascot or logo that speaks to and doesn’t offend every country participating in the Olympics is no small feat. So to play it safe, every two years, the Olympic committee seems to take a different amorphous blob, give it a name like Itzy or Whattzit or Whozit, parade it in front of an incredulous public, and then make sure that it’s completely forgotten by the time the press conference announcing it is over. Rather than try to explain to you the unexplainable, I would rather just send you to this list of nonsensical smiling animal things. Make no mistake, every all-star game in every sport is a marketing gimmick, introduced as a device to promote their respective leagues or sports. However, because the games can be entertaining, we forget that we are essentially watching an two-hour advertisement. Which is a testament to the effectiveness of all-star games. Except for the Pro Bowl. Until last year played AFTER the end of the season, in Hawaii, with little contact and passion, the Pro Bowl served as the football season’s death rattle – a sad, trivial event that ends the season with a whimper. No one really benefited from this arrangement. Beckham never got to establish himself in America, as was the plan, and the MLS didn’t make great strides towards convincing Americans that soccer players weren’t pansies with the chronically injured Beckham holding court on the bench. Soccer remains unpopular in the US, and Beckham remains a celebrity along the lines of a Kardashian sister. No big winners there. Quarterback Challenge was an annual off-season football event in which some NFL quarterbacks would get flown to a tropical location, run around some cones, wear visors, and throw footballs into moving baskets. That’s it. That’s the Quarterback Challenge. The contestants took it about as seriously as it deserved to be taken, and consequently, the winner was rarely a best-in-class quarterback, but normally a schlub like Jeff Hostetler or Jake Plummer. Pass. The 1973 debacle known as “The Battle of the Sexes” between Billie Jean King and Bobby Riggs was supposed to serve as a way to expand tennis awareness and, consequently, expand the fan base. It may have made the public more aware about tennis, but not in a good way. Leading up to the Houston showdown, the refined game of tennis was looking more like the WWE than the country club, blue-blood pastime. Riggs played up the chauvinist angle, making misogynistic statements to goad some hapless female player to take his bait. Well, Billie Jean King said “enough” and made short work of the 55 year-old, but the damage had been done to tennis’ reputation from the spectacle.